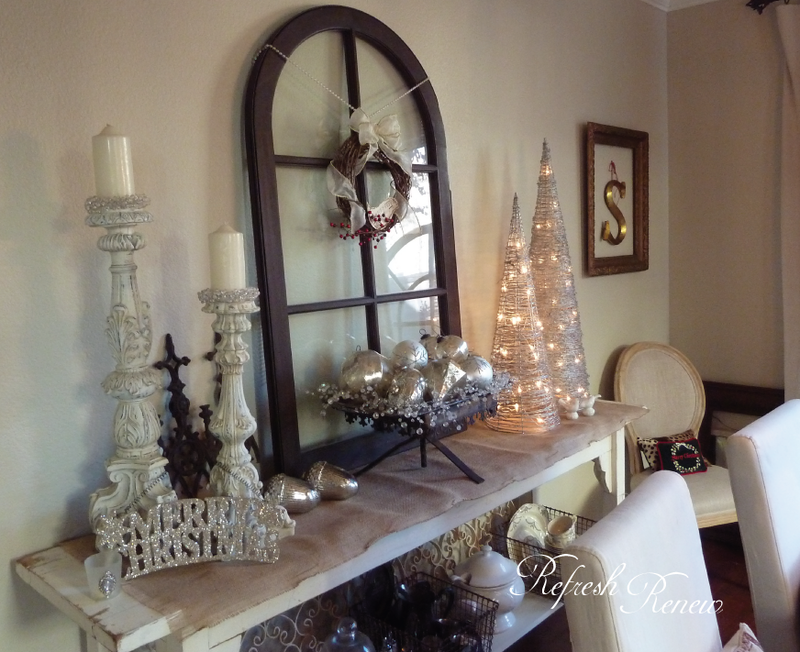 There are so many wonderful Christmas Home tours out in blog-land lately. I just had to jump in on the fun. 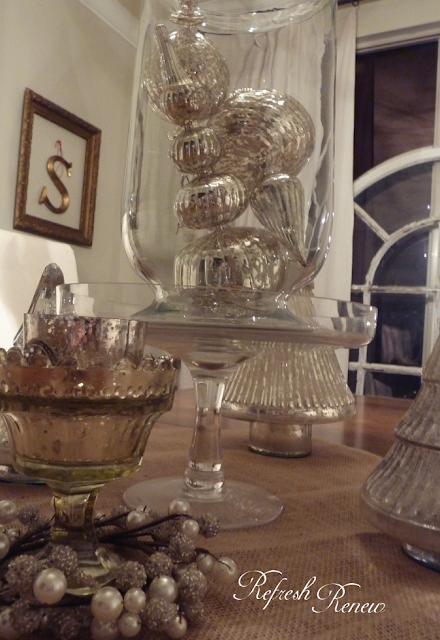 that decorating the home front has a quality of "divide and conquer" as I have time. We moved into this home Dec 1st of last year and threw up everything as fast as we could unpack. It was fun this year to really have time to find new homes for all my favority sparkly things. I invite you to tour my dining room. 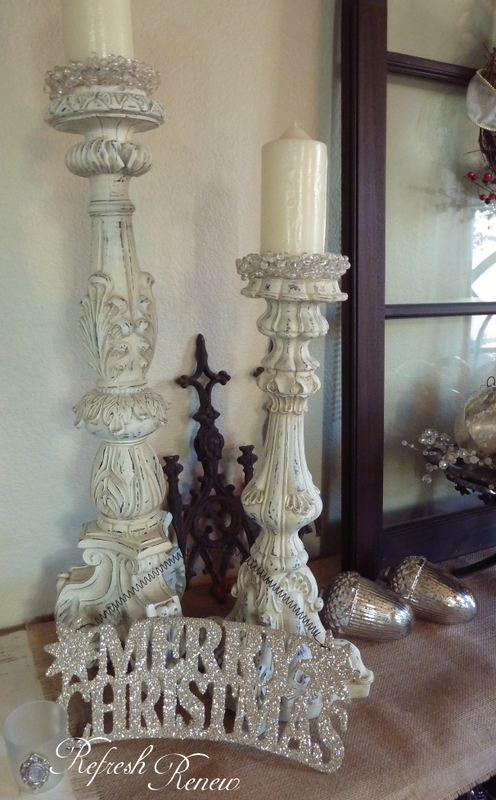 Most of my decor is silver or white. 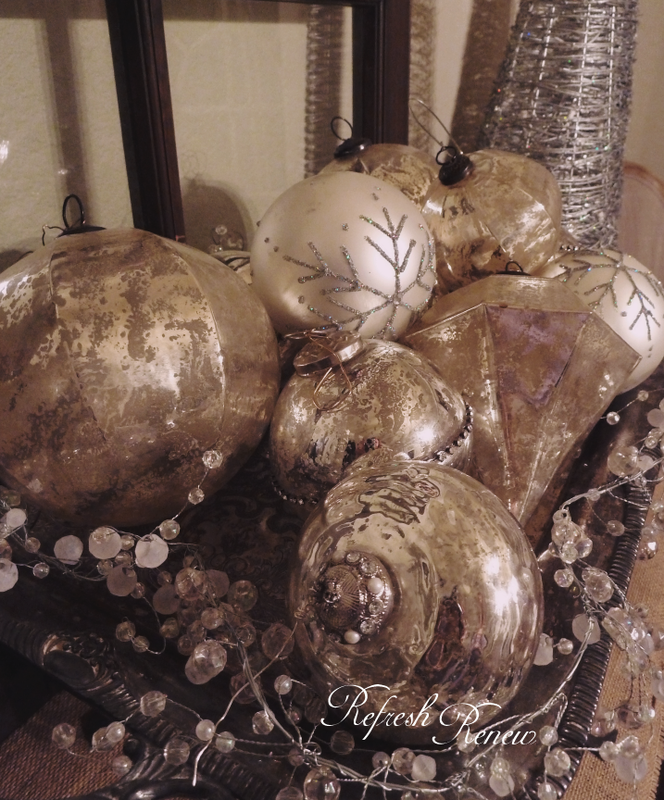 I have stuck to that theme from the beginning of my adult years of decorating! 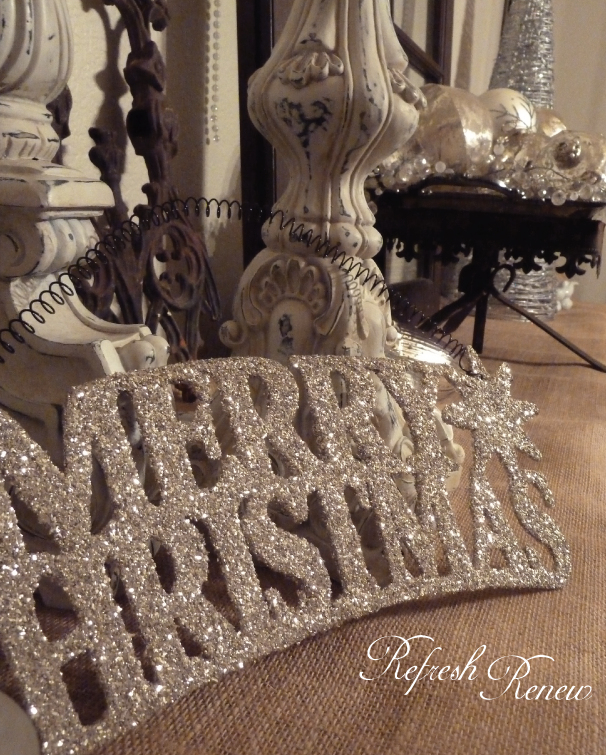 I love the magical effects of white and silver and crystal! The more sparkle the better! now look perfect on my "new" shutter buffet. 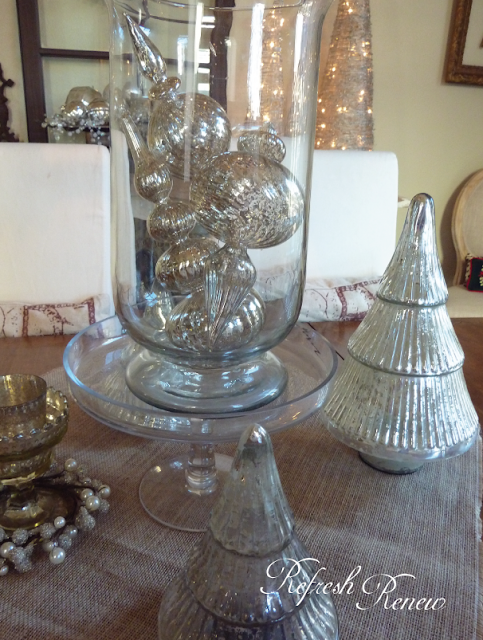 My collection of large mercury glass ornaments displayed on a vintage silver tray. 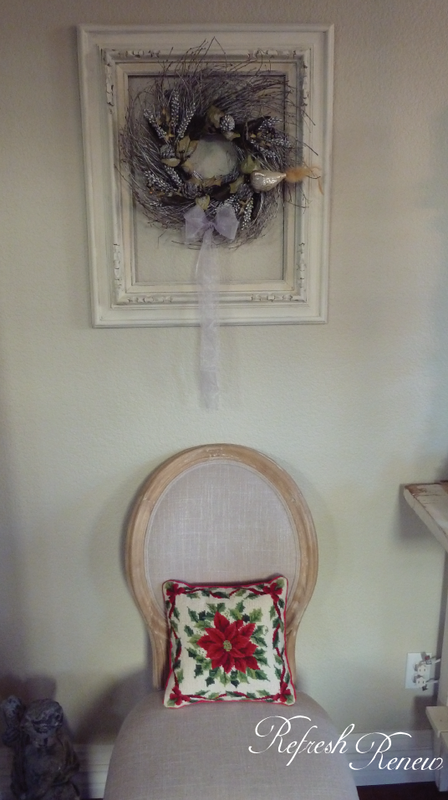 A salvaged arched window with a vintage simple wreath. A salvaged and painted frame features a vintage silver wreath. Mercury glass ornaments displayed in glass for my centerpiece. Sparkle silver on burlap runner. 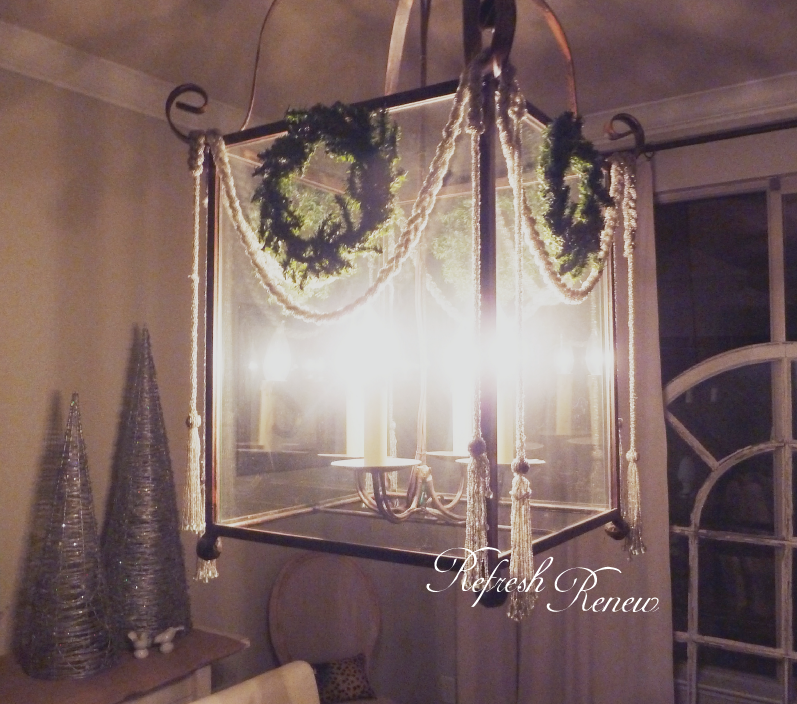 I draped four silver beaded ropes around my lantern and finished with mini wreaths. I will be posting other rooms next week as I finish and photograph them! 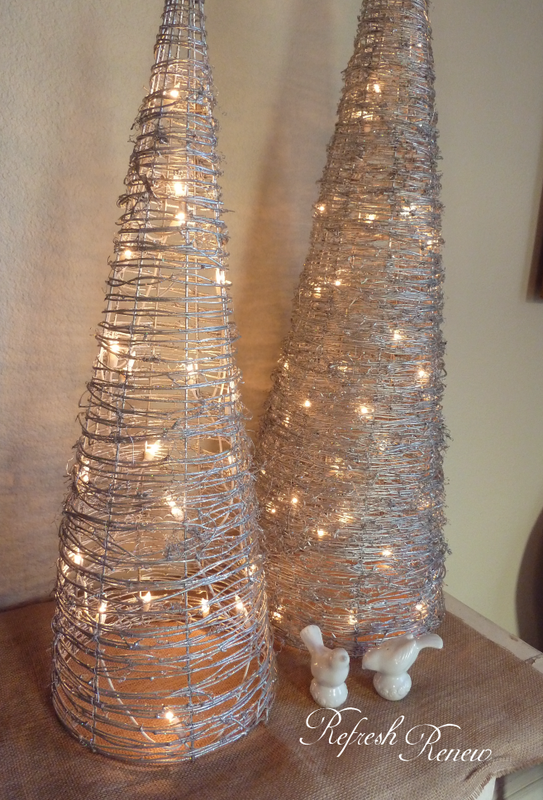 I'm new to your blog and am really enjoying your posts and projects. Your decorations are SO pretty. 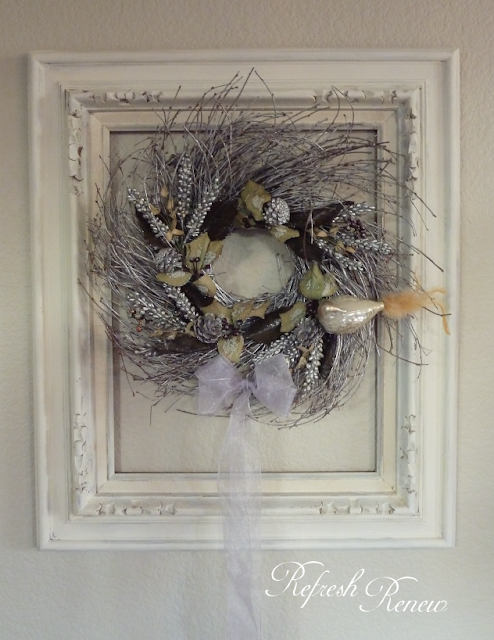 I particularly like the frame and wreathe. Have a very Merry Christmas! So pretty. I love the arched window. thank you Maria for visiting! 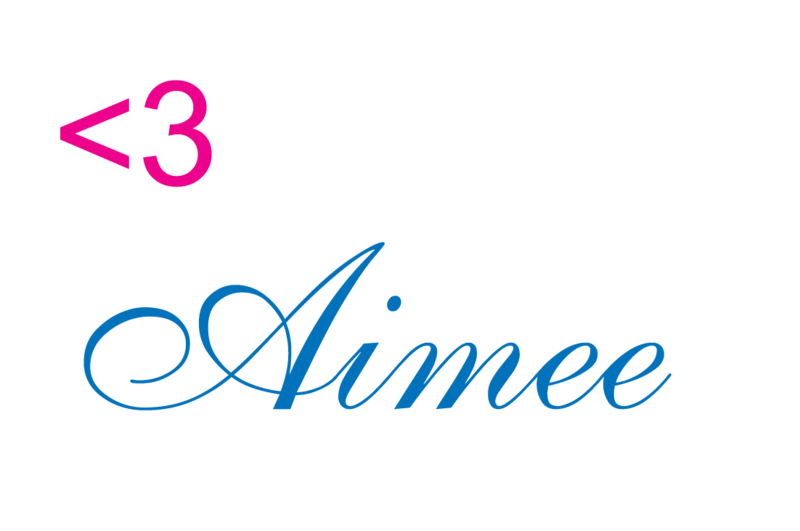 just gorgeous, aimee! 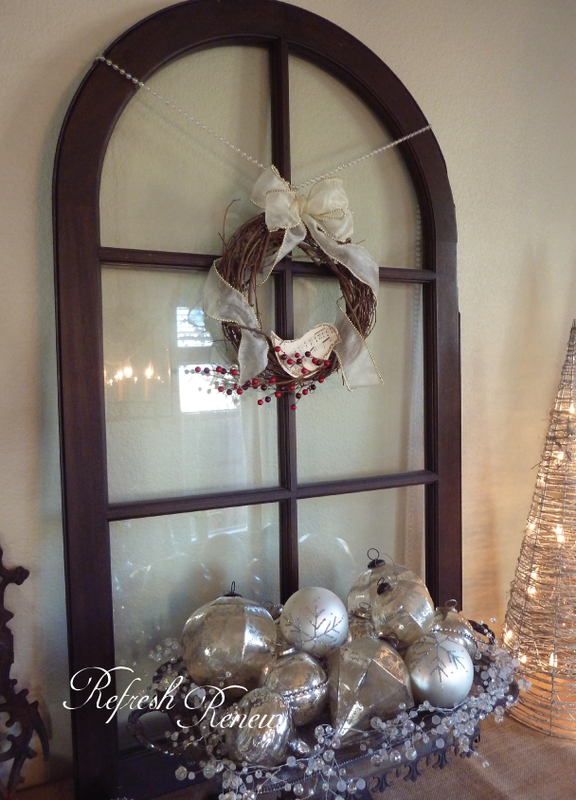 LOVE the arched window and framed wreath,esp! can't wait to see more of your home--happy weekend! 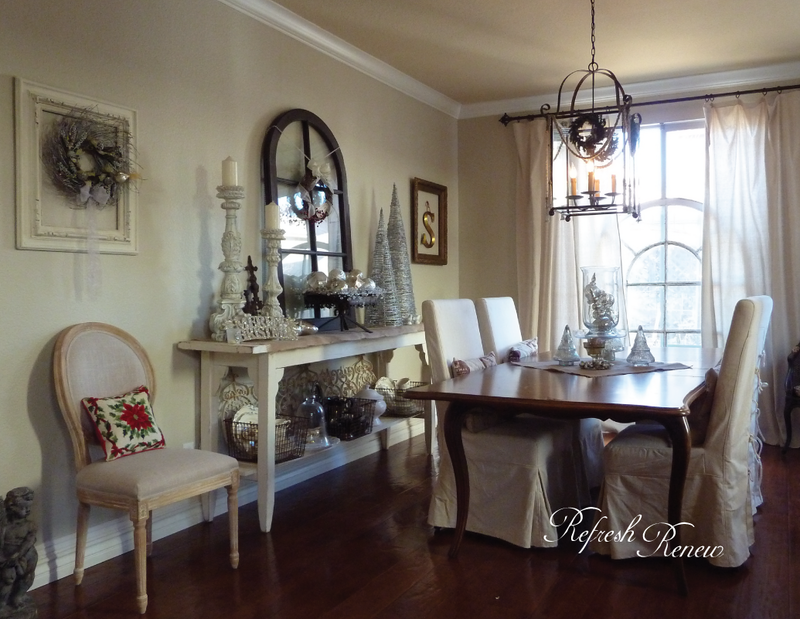 Such a lovely dining room! I love all the sparkly bits! your dining room is wonderful, love how you've decorated that amazing lantern!! 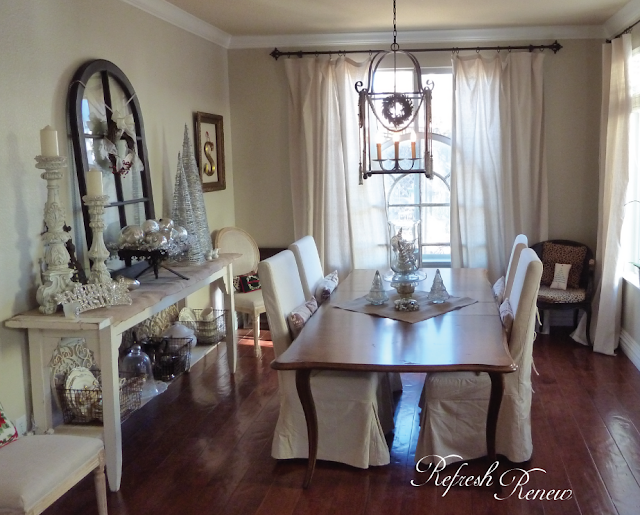 Wow Love your dining room....and your lantern over your table is spectacular! You must have an incredible handy man?!?! Aimee, everything is just gorgeous! I love the color combination, so elegant and calming. Can't wait to see more, thanks so much for sharing with us! So beautiful! Love the Silver and white decor. Thanks for sharing at TTF!